Mix all the ingredients in a large and round mixing bowl, put the olive oil, vinegar and a bit of salt. 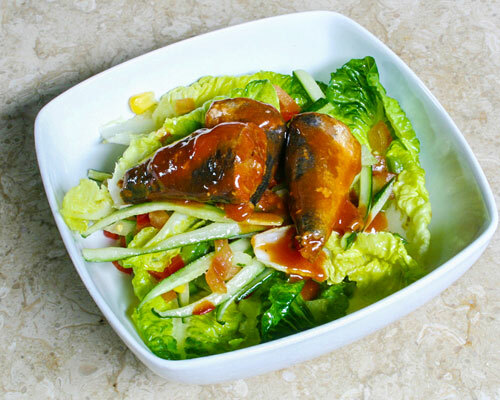 Arrange the sardines on top of the salad and top up with tomato sauce to your taste. Comments: This recipe is loaded with Vitamin C, an important vitamin & a potent antioxidant that protects against stroke and heart attack by lowering blood pressure and LDL ("bad cholesterol") levels. It also aids the absorption of iron present in the dish. 44% of our recommended daily intake of calcium is derived from this dish which is important to keep the bones healthy. Saturated fat -- from natural, whole food sources like an egg, fish -- are not necessarily bad especially when you don't overeat them and balance them with fats from the other families, like Omega 6 and omega-3's which play a crucial role in protecting the heart from various diseases.